Increase client revenue by helping them turn visitors into customers. 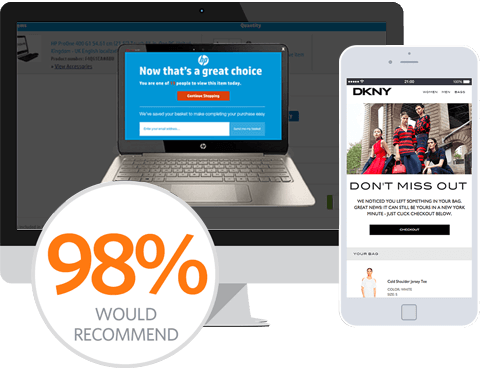 When your clients use SaleCycle solutions to turn visitors into customers, it’s a real win-win. The better their campaigns perform, the more cash we’ll send your way. Help your clients increase conversion rates, recover abandoned sales and drive customer loyalty with SaleCycle. Using the latest email, SMS and Onsite campaigns, your clients will create a personalized customer journey that converts. You and your clients can get 24/7 access to our live dashboard. See for yourself, in real-time, how your clients’ campaigns are performing and use the data to plan your next SaleCycle referral. We partner with some of the leading email providers, tag managers, technology solutions and affiliates to help some of the World’s biggest brands improve their online customer journey. What Can Your Clients Expect. Every client has their own SaleCycle account manager who helps support and optimize their campaigns. Your clients just have to sit back and watch the results come in. Your dedicated Implementation Consultant will provide an approximate timescale once they have determined the solution we are going to implement for your client. We work with enterprise brands to help inspire, shape and support the conversions that exist within every customer journey, increasing sales by up to 8% along the way. Our clients get 24-hour, 365-day access to the SaleCycle reporting platform, where they can view their results in real-time. Working as an extension of the client’s team, our designers craft bespoke, yet on-brand, designs that seamlessly integrate with their latest marketing campaigns. Using the latest email, SMS and Onsite technology, SaleCycle will help create campaigns that convert.